Irish Oatmeal with Cinnamon, Maca Powder, Maple Syrup, Chia Seeds, Blueberries, and Almond Milk. Coffee with Cream and Honey. It's officially the first warm delivery shift of the season. I've got the windows down and the wind blowing across my jojoba-oiled beard. Wearing the sun sleeve to protect from UV rays. Whole Wheat Almond Meal Chocolate Chip Cookies. It's actually stupidly slow for deliveries. I take advantage of the down time to take care of necessary tasks in the restaurant like filling the dumpling sauce cups, prepping bags, bagging noodles, etc. At the end of the dinner rush I put up with a headache and some kind of energy crash. The longer delivery drives make it difficult to stay awake. Fried Shrimp with Broccoli, Onions, Carrots, and Rice in Garlic Sauce. At the god-forsaken storage unit just to practice singing a couple songs for a show coming up on Monday. This place isn't comfortable anymore after the water damage. I can't wait to move into the new rehearsal space. 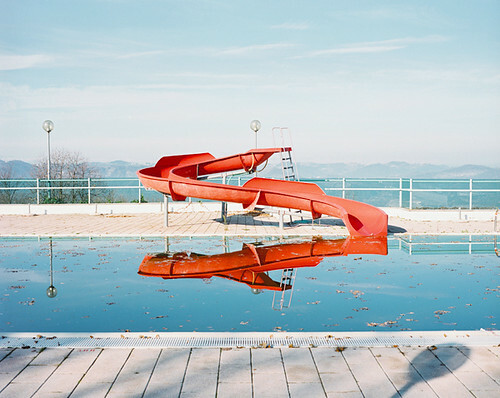 [i] Pool Slide. Source Unknown.